The international co-operative movement has prioritized supportive legal frameworks as a key constituent of co-op growth (ICA, 2013), but there is not a robust literature on policy support for co-operatives. Supportive legal frameworks for co-operatives are a “deeply under-researched area” (Adeler, 2014, p. 50). Based on our review of existing literature, however, we found that there were six primary forms of policy support that have been successfully deployed internationally: co-op recognition, financing, sectoral financing, preferential taxation, supportive infrastructure, and preferential procurement. 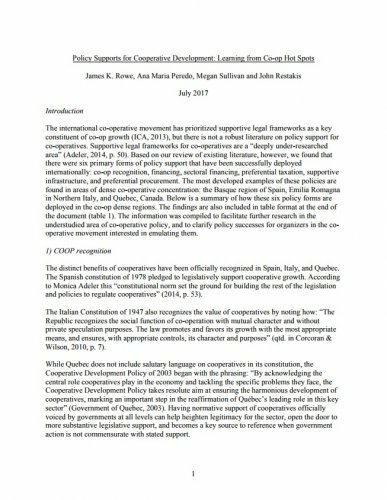 The most developed examples of these policies are found in areas of dense co-operative concentration: the Basque region of Spain, Emilia Romagna in Northern Italy, and Quebec, Canada. Below is a summary of how these six policy forms are deployed in the co-op dense regions. The findings are also included in table format at the end of the document (table 1). The information was compiled to facilitate further research in the understudied area of co-operative policy, and to clarify policy successes for organizers in the cooperative movement interested in emulating them.